At Joe Cornfield's Wallpaper & Window Treatments you will find more than great window coverings. 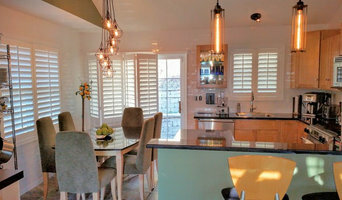 Whether you are shopping for a single window treatment, redecorating your entire house or seeking the solution to a complex design challenge, you'll find great people who have the knowledge and expertise to help you put it all together. We proudly serve West Hartford, CT and the surrounding area. Since we're locally owned and operated, we take our long-term commitment to the community seriously, and we are proud of the professional products and services we provide. We are here now - and we'll be here in the future when you need us again. Call on us for your next design project! We're open Tuesday-Friday 10-5, Saturday 10-2. 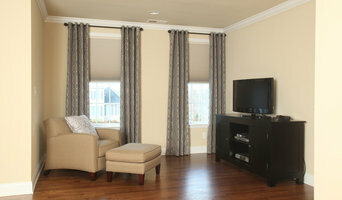 Budget Blinds of West Hartford serves the West Hartford, Avon, Farmington, Hartford, Newington and Wethersfield areas. The company proudly serves local homeowners and businesses by offering complimentary in-home consultations, professional measuring and precise installation. Budget Blinds offers a rich selection of quality window coverings that include shutters, blinds, draperies, shades and window film. In business since 1994, A & M Designs sells, measures and installs all types of window treatments and motorized products custom made for your home. We are located in Wallingford, CT, a centralized location, which makes it easy and convenient to travel throughout CT and to surrounding areas. We provide professional measure and installations, specializing in motorization, along with quality products from Hunter Douglas, Graber, Norman Window Fashions, Comfortex, Lutron, Somfy, QMotion and more. We help make your home beautiful by fabricating custom window treatments, cushions (indoor/outdoor), slipcovers, pillows, bedding and table linens. 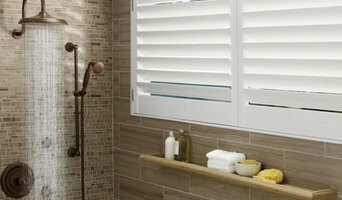 We also sell Hunter Douglas shades and blinds. We carry several lines of fabrics and drapery hardware We are also a professional workroom providing services to interior designers and custom decor retail stores. Finishing Touches by Dianne provides expert in-home or in-office service for choosing all types of custom blinds, shades and drapery hardware as well as custom drapes or curtains, valances, cornices, Roman shades & custom bedding for every style home or office made in our area workrooms. No matter what your style preferences, window treatment design requirements or budget, choices ranging from traditional to eclectic and contemporary to formal are represented here and limited only by your imagination. We bring the samples to you. Private in-home consultations, quality designs, computerized design renderings, custom fabrication, and professional installation services are available for most every budget. The Finishing Room is a full service drapery workroom exclusively to design professionals. For over 20 years, owner Lisa Salvatore, has built her reputation on her advanced craftsmanship and attention to detail ensuring the highest quality product. She enjoys collaborating with designers toward the realization of a design vision everyone can be proud of. The Finishing Room offers a full range of services from measuring & digital design through installation. New and experienced design professionals benefit from our experience and timely responsiveness. We are committed to maintaining clear communication throughout a project ensuring that every need is met. Custom Window Treatment Specialist, Master Seamstress and Designer with 25+ Years Experience. I offer impeccable workmanship as well excellent personalized customer service. I love creating unique and special things for each client's home that reflects who they are. Our home is our sanctuary and when it is filled with beautiful custom hand made pieces, it creates a joyful environment to live in. I am inspired by the myriad of ways a space can be transformed using color, texture and design. With over ten years in the interior design realm, along with extensive experience with structural design, I bring a wealth of knowledge to every project I take on. I am an active member of ASID and a regular reader of all things design; a few favorites include Interior Design Magazine and Architectural Digest. When I’m not collaborating with a client, I enjoy cooking, tennis, baseball, volunteering for Habitat for Humanity and spending time with my three children.